“Would you like to take their photo,” the dog owner asked without hesitation, already reigning in her three large pets. 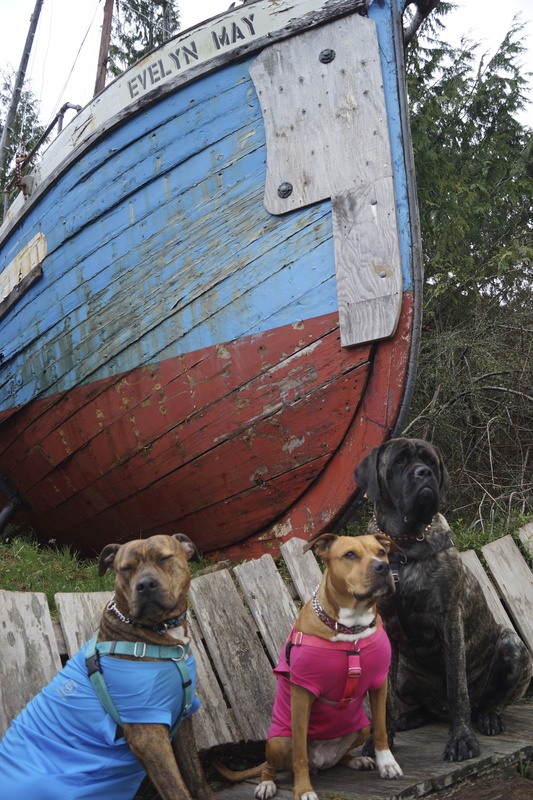 We had stopped to take a photo of an ageing wooden boat on the main street of Ucluelet. “That would be great, if you’re sure?” I asked. But the lady, who introduced herself as Janice, was already scooting her three dogs up on the bench that was positioned in front of the Evelyn May. Its once brilliant colours still brightened up the otherwise ordinary street. The fact that it had become an unintended focal point on main street in a small Canadian town, didn’t surprise me. 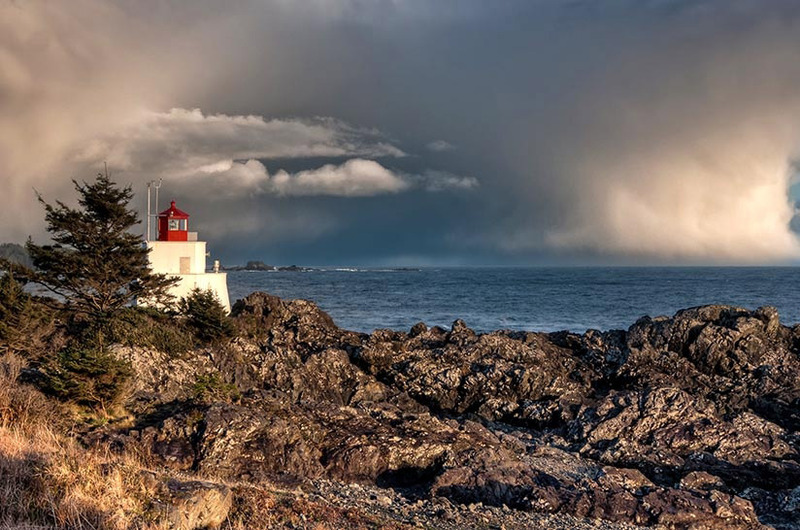 Vancouver Island is that kind of place, comfortable in its unpretentiousness, resplendent in its natural beauty; an incomparable delight at the continents edge. It took ten minutes or so to get the dogs positioned just right, but Janice didn’t mind. She was more than pleased to display her three adorable hounds and they just happened to be wearing colours that complimented the faded hues of the Evelyn May. It had been like this, the last 24 hours, chance encounters with many friendly folk. 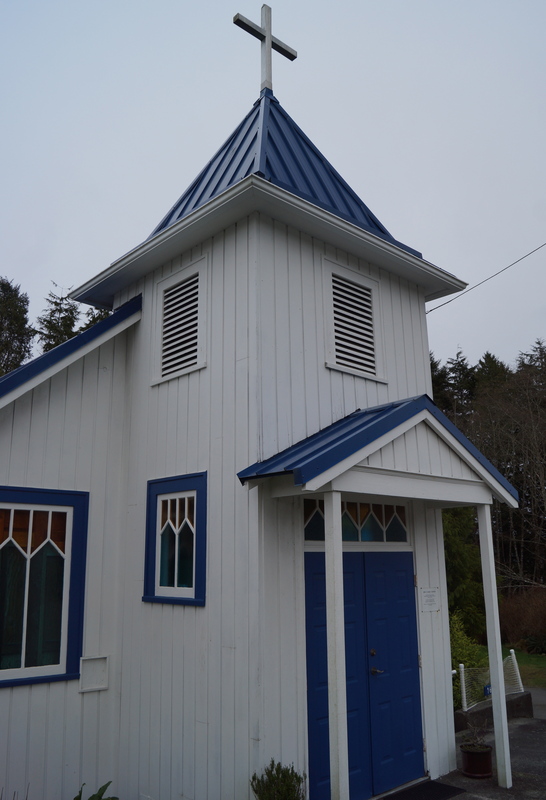 We had made our way from the structured elegance of Victoria and woven along the Pacific Rim Highway towards the ocean, to the wild margins of Canada’s most westerly point. We had purposely taken our time, stopping frequently when our curiosity was piqued. And there’s been much of that. Sites that we were pleased to have stumbled upon; people with whom we were thankful we had stopped to share a moment. For Canadians, visiting this part of the country is on most people’s wish list. The surfing, kayaking and whale watching, the seamless marriage of ocean and rainforest, the inviting harbours and superb seafood. The island is a living picture of ethereal beauty, but also home to thriving trade and industry. In the small harbours and hidden inlets are lumber mills and mining, fisheries and canneries, fishing trawlers nestled beside gleaming white yachts. 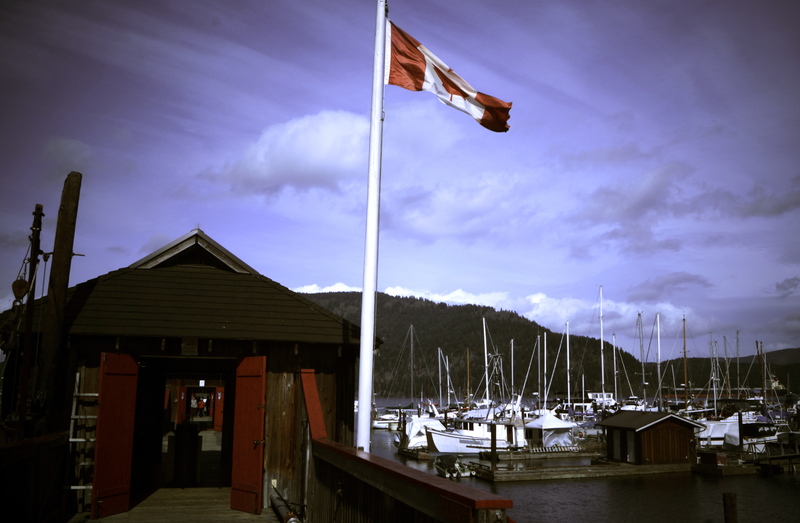 We chanced upon one such place; Cowichan Bay with its long history as a fishing destination. From the early 1900s, Cowichan Bay attracted sportsmen from all over the British Empire for superb salmon fishing, earning the name of Salmon Capital of the World. It also beckoned celebrities such as Bing Cosby and John Wayne in the 50’s to fish for sport. Tales abound at the renowned local hotel of legendary fishing conquests from those days. It’s a peaceful bay where whales are said to wait patiently for the salmon run; anticipating the feast that will come their way. 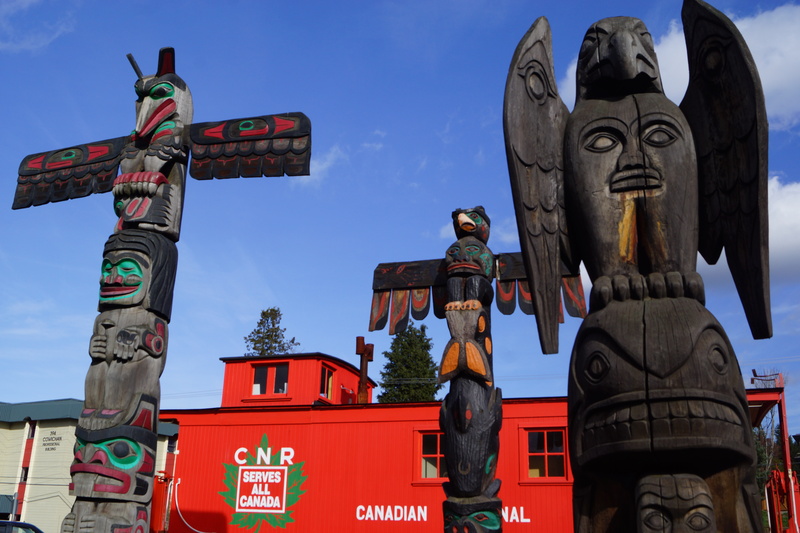 The drive took us onwards to the the small city of Duncan, home to more totem poles than anywhere on earth. 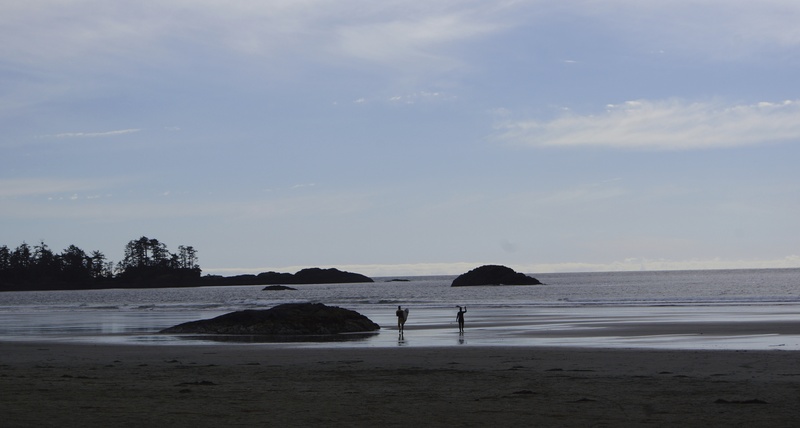 This is the land of the Coastal First Nations who carve their legends and lore into towering cedar logs. I am transfixed by the vivid colours and enchanting stories that inspire this unique art. It’s here that we met Robert from the Cowichan tribe, one of the ‘people of the warm land’. Robert sat on a bench surrounded by the symbolism of his ancestors, backdropped by a bright red Canadian National railcar. He lamented wryly that despite being drawn to this spot for inspiration, ironically, because of an allergy to cedar, he could never linger long. Robert told us that his great regret was never being able to give ancient stories life through wood carving. He took the time to relate his painful upbringing in a residential home, of the wayward ways of youth in his tribe and of better times now emerging in Duncan. I pointed out to him that Mr. Duncan himself was carved in the tallest totem towering nearby, a reminder of the confluence of tribal and settled lands. I asked him whether he regretted living here. “No, I’m happy in Duncan, it helps me forget the past. I hope you like our town.” Robert said to me with an appreciative smile. “Where are you from?” Skirting the complexities of my life, I told him that I didn’t live in Canada full-time, but that I loved being here and learning about his history. “In fact,” I told Robert, “I’m from Alberta originally and hadn’t quite appreciated the vast differences between the coastal and the plains First Nations people.” I was really only now coming to appreciate this. Instead of hunting and subsisting on the buffalo as the tribes of the plains people had, the coastal people had relied on the ocean, primarily on whales. Given that the whale hunt was crucial for survival, whalers were the one of the most honoured members of the tribe. The expedition to intercept, kill and tow a whale home with a canoe in the open ocean was perilous. Not least of which was first the necessity of stitching up the mouth of the whale, so as to not take in more water and thus sink the crew and canoe. Every part of the whale was instrumental for survival. As with the plains people, I sensed there are many aspects from these former days that are keenly missed today. On we went from Duncan to Parksville where we walked on the tidal flats of Qualicum beach. Rippled sand, Brant geese on their grand migration gorging on eel grass and sea lettuce, the moon pulling on the tidal waters. At dinner our waitress asked where we were headed. 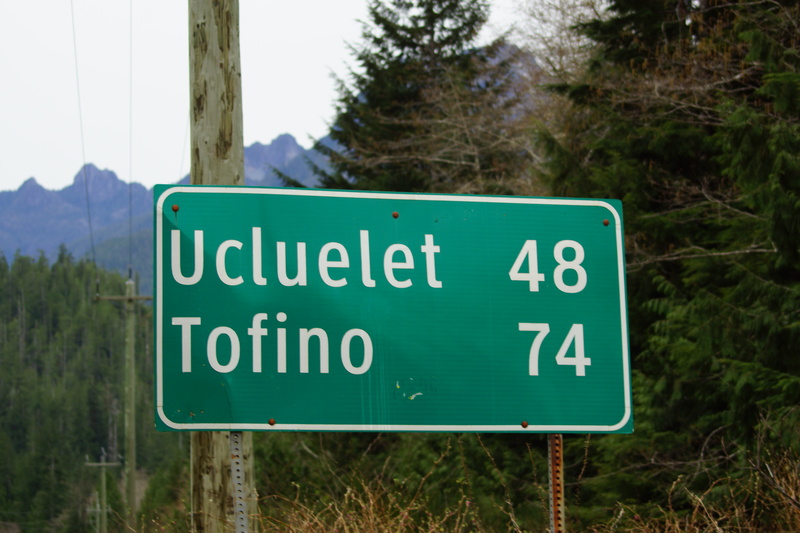 “We’re on our way to Ucluelet.” I replied. “Yes that’s where we’ll be, glad to hear that.” We chatted a little more and I asked where we should stop along the way. 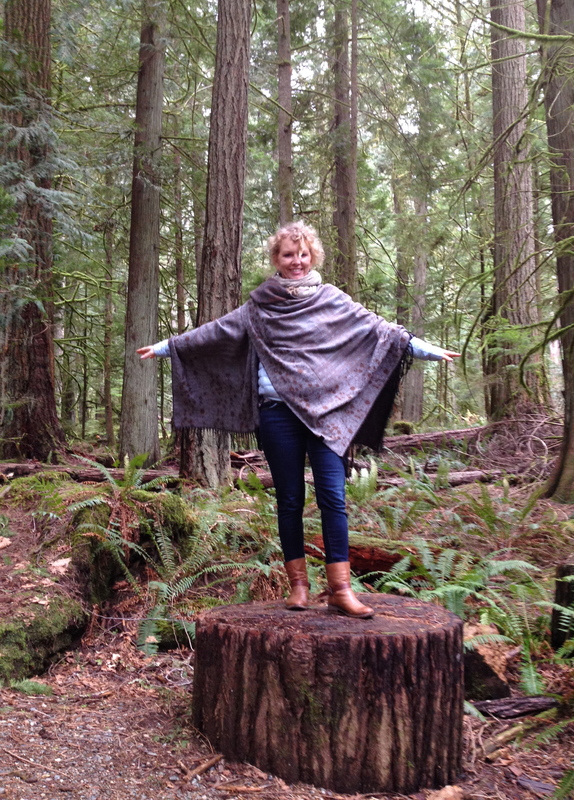 She told us the drive was beautiful and not to miss Cathedral Grove. As we cut west towards the Pacific, we soon found ourselves there. Captivated by the beauty, we ambled through old growth forest where 800 year old Cedars and Douglas Firs tower over ferns and mossy, twisted branches. As eagles swooped over dizzying tree tops, I could appreciate the reverence for the cedar tree. Every part of it was used by the First Nations. The inner bark was woven into mats, baskets, even waterproof clothing. Branches became ropes and the rot resistant wood was fashioned into canoes, houses, totems and ceremonial masks. In fact, the regions first inhabitants simply called it…the tree of life. When we got to Port Alberni it was very much in the clutch of a spring chill; a counterpoint to the budding cherry blossoms, the bright daffodils and lime green willows. 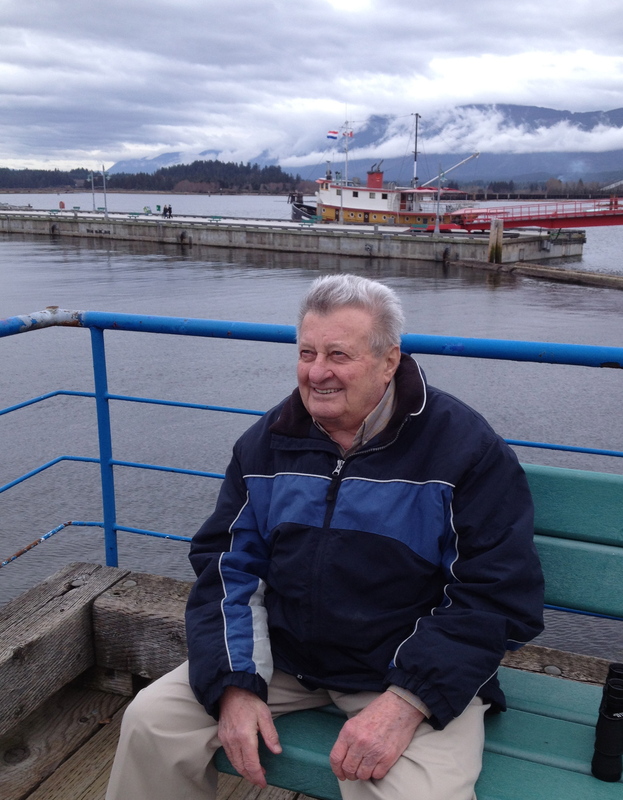 We walked along the harbour, the pulp mill belching into the misty air, snow lingering on distant peaks. We came across Angelo, sitting on a bench with binoculars, spying across the inlet. He was keeping an eye on the logging unit he had worked with for 38 years. “I moved here from Italy after the Second World War, through Ontario but I eventually found work here. The pulp mill was hiring,” he told us, his handsome face belying his 80 some years. When I asked Angelo if he had any regrets that he moved to Canada, he shook his head. “It’s been more than a happy life and besides, I have too many Canadian grandchildren to ever return to Italy,” he told us fondly. We talked awhile and shook hands. I sensed he was pleased that we had taken the time to chat, as were we. 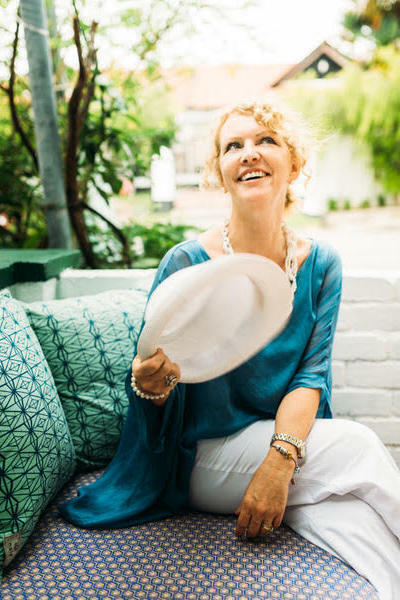 If I’ve learned anything at this stage in life…it’s to take the time to converse. Connecting with people and hearing their story is always a privilege. 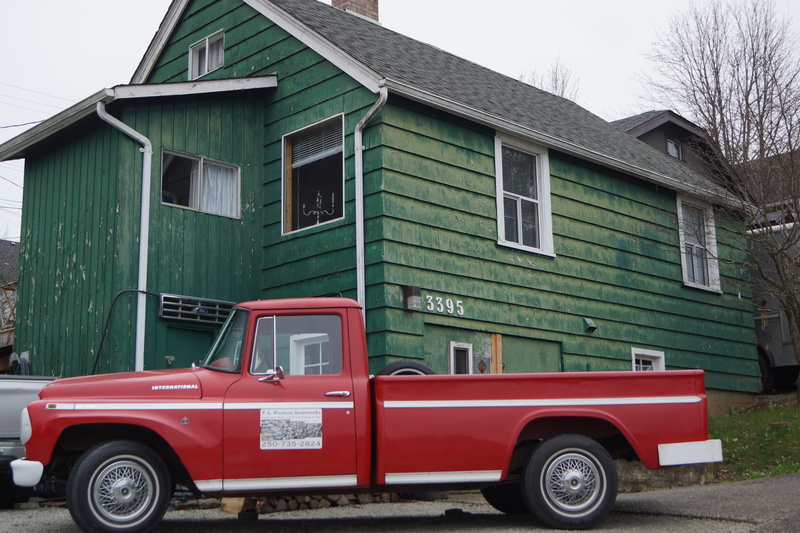 We also took the time to slowly cruise the back streets of Port Alberni, chancing upon colourful, striking everyday images. 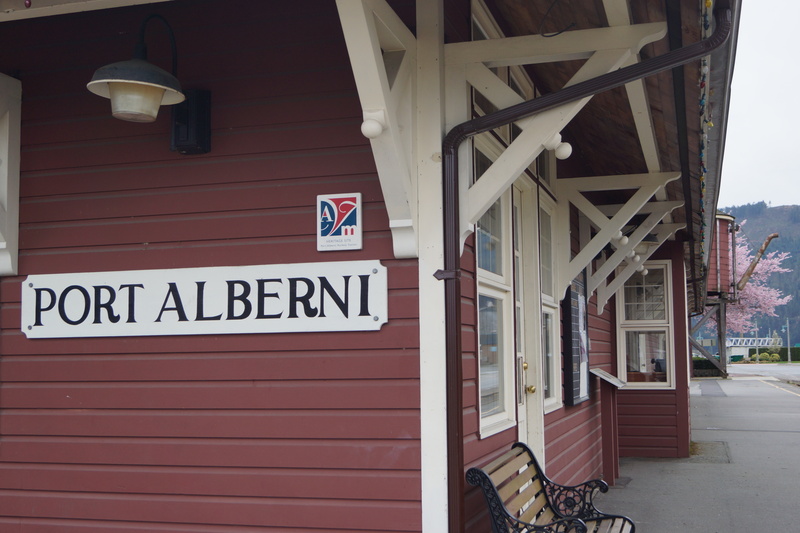 Port Alberni also retains its original train station, a design that is emblematic of most small towns in Canada. Constructed from the same blueprint, these iconic structures have welcomed people like Angelo as they arrived from afar to build a new life in Canada. Now the train tracks are less busy, with once useful cars spruced up for museum pieces or left to rust. A reminder that few things stay the same in life, but also that there is beauty in the old and abandoned, as well as the vibrant and living. Onwards to Ucluelet where we planned to spend some time, between here and Tofino. As we checked into the Black Rock Oceanfront Resort, a welcoming young man, Mustafa opened up a local map to show us the region. “The Wild Pacific Trail is right outside, if you’re lucky you’ll see whales as you hike along it,” he offered. “Wonderful, we heard the Pacific Rim Whale Festival is on this week, hoping to see some! Are you from this area Mustafa?” I asked. “I’m originally from the Middle East, I came to work for a summer and never left.” I looked past him to the massive windows beyond the lobby. They frame the Pacific ocean as it pounds against the craggy black rocks. “I understand why,” I said, full with anticipation of the stay ahead. Full of new found appreciation for this special place on earth. I first met Rysgul at our hotel where she works in sales. It was a fleeting moment and our paths didn’t cross again until a recent cocktail evening. I was immediately struck by her warmth and we chatted easily. When I asked what her name meant, Rysgul replied “It means ‘kind flower.” Her name suits her perfectly; she has a modest grace and classic Kazakh beauty, embodied in dark enchanting eyes and glossy black hair. “I’m a newlywed,’ she happily announced early into our conversation. After congratulating her, I steeled myself to ask the question, curiosity getting the better of me. “Did you marry a ‘prince of the hearth?’ “I did,” Rysgul beamed, “so yes, I now live with my husband and his parents.’ I was referring to the Kazakh tradition of the youngest son taking the role of…’prince of the hearth.’ It is his duty to live with and care for his parents. When one marries ‘the prince’, custom dictates that the bride moves to his childhood home. This new extended family isn’t for a month or a year; it’s a life long commitment. Rysgul explained that she was raised to respect this tradition and is proud, as is her family, that she’s now in this role. When I ventured that this would be considered unusual in many Western cultures, she did not waver or appear to desire it any other way. Rysgul is a modern woman, yet committed to traditions that bind this area of Kazakhstan together, more so than other parts of the country. “I’d love to hear more about your culture,” I said, ‘and of course your wedding. I’m also curious about your striking wedding jackets and the unique hats you wear.’ Having noticed countless weddings at the hotel, the premier venue in the city, the questions were already forming in my mind. “Yes the kamzol and saukele, we could do an interview if you’d like?” Rsygul responded graciously. 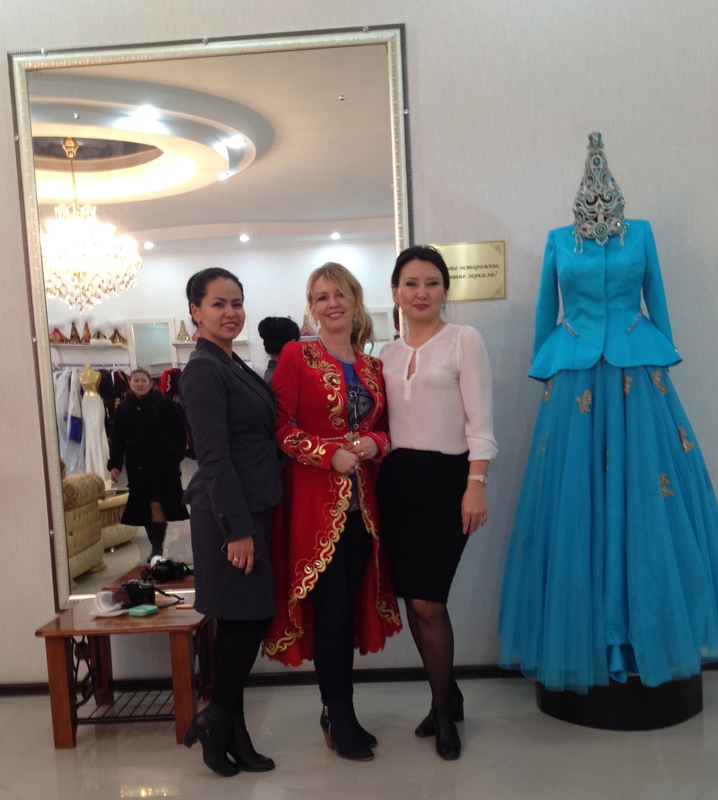 What followed the next day was a delightful two-hour conversation and an outing to the award winning showroom, Nur Shah. It was an unexpected insight into the journey of a modern day bride, one that is still very much layered with tradition. Where did you meet your husband Rysgul, how long were you engaged? We met in a nightclub; neither of us were particularly in the mood to be there. We dated for about four years, but once you get engaged here it all happens quickly. In Kazakh tradition, a group from the boy’s family visits his girlfriend’s parents, they sip tea and eventually ask for her hand in marriage. A female relative of the hopeful groom adorns the girl with golden earrings. This means the girl is now taken, engaged. My fiancé offered a diamond ring as well. A day was agreed upon and it was official. Typically, an engagement is only 2-3 months. Is anything given to the groom’s family? Yes, depending on the status of the family, some money is given. It’s like a dowry to compensate for what the groom’s side has spent on new furniture, houseware, bedding items and carpets. There was once the tradition of giving 47 head of cattle for a bride. This has transformed into presenting a korzhun, a traditional bag with 47 various gifts inside. The bags are decorated with coins, rings and bead necklaces. They are passed down within the family. There are two wedding ceremonies, the first is for me as a send off, which was here at the hotel. All of my friends were here and my husband’s siblings. Is that when you wear the beautiful kamzol and the saukele? Yes, the traditional part of the wedding is when I wore the national dress or kamzol. I felt like a princess. The silver jewellery is also important, kind of good luck charms. That’s also when my braids were displayed. Tell me about that, the knee-length hair that many young Kazakh women have. It is the custom, if possible, to grow our hair to this length at least until we get married. It’s considered very feminine and beautiful. Yet when we do reveal it, we should off-set it with big bows or even bells, so as to not appear vain. I’m sure it looks stunning, to say the least. Is it shown at home? Only to my husband. When I get home, my outer image changes. I go into my room and change into a caftan type dress, a white kimishek* covers my hair and we always cover our feet. It’s then time to cook the evening meal which I do gladly. My mother in-law will get started if I’m delayed. So your ‘first wedding’ is traditional. Is it after this you begin life in your new home? Yes, there was a ceremony after the wedding party, we entered the home to singing and dancing. It’s the custom that my new sisters in-law put a kimishek on my head as I kneel down. A fabric threshold hangs behind us which is white, but a woven red fabric is then draped over that, symbolizing the new marriage. This ‘artifact’ hangs in the home until I become pregnant. That evening there was also a dombra player who offered marital advice through music and prose. It sounds lovely, and the second wedding? Is there a ceremony at the mosque? Did you have a honeymoon? Was it difficult, adjusting to joining his family home? The blessing at the mosque can be done beforehand. No, we don’t have a honeymoon and for me it was quite natural to make the change. Every morning I greet my in-laws with a type of curtsy and a cupped hand gesture, as tradition calls for. (I had noticed this Sufi symbol of a blessing depicted in an ancient mosque and often see references to it.) But I’m able to be independent and still work, however some brides that are younger may be required to stay in the home. The foundation of our culture is respect for elders, this is ingrained in our tradition. Your family must miss you Rysgul? Yes, but I see them often and soon it is the three month mark. They will come to my new home for the final ceremony and bring my dishes and household goods that I’ve collected. Also, my in-laws will give a present to my mother, an acknowledgement that their daughter is now with a new family. Is there one special present or does if vary? Well, it depends on social status but in our case, it will be a fur coat. Gosh how lovely. Is that the reason so many women here wear fur coats? I’ve never seen so many gorgeous furs. Yes, it’s one reason and by that time in life, having a fur conveys a certain status. Very interesting. Tell me, is there any chance that having gold teeth was once a status symbol? (I allude to the many men and women here in their 50’s or older that have golden teeth. They’re often conscious that this is no longer ‘in fashion’ and hide their smiles.) Yes, exactly, that’s what it was. People melted down their jewellery to have it converted to gold teeth. Do you plan to have children? But of course and as you know, we are fortunate as the grandparents help raise their grandchildren. We don’t have to worry about child care. One last question. How does your society react when a Kazakh woman marries a foreigner? My parents would have been heartbroken, probably wouldn’t have allowed it in some way, but I do know a few friends that have. They love their husbands and lead a different life. But to a certain extent, they’ve walked away from our proud culture; I could never have done that. Late the next afternoon, as promised, Rysgul is waiting, ready for our rendezvous. She directs the hotel driver to Nur Shah, the acclaimed showroom. As we make our way in the rush hour traffic, I’m told that we’re going to the preferred place in which to buy kamzols for a ‘first wedding’ or for celebrations. The showroom began as a small home business, but the exquisite designs have now become status symbols. When we arrive at the nondescript building, its drabness surprises me. It offers no hint of the sumptuous atmosphere inside. “It’s our custom when you enter a place for the first time, that one should make a wish.” Rysgul tells me as she holds the door for me to step inside. A massive chandelier hangs in the centre of the room, illuminating a large Persian carpet on the marbled floor. My eye is immediately drawn to the array of exquisite kamzols and elegant dresses. They’re resplendent with glittering stones, jewels and intricate design work that intertwine symbols of swans necks, flowers, even the horns of mouflon sheep. Here, a woman’s beauty is compared to the graceful curves of a swan and as they mate for life, their likeness is the inspiration for the ever present motif. Stitching on garments and hats also echoes the past, but Nur Shah has expertly incorporated an intriguing modern flair. I can well imagine the excitement a bride to-be must feel as she enters this feast of wedding indulgences. Nurbibi, the lovely assistant, kindly allows me to try on a number of Kamzols. They feel elegant and sensual. I sense the tradition the garment embodies. Much as I admire the saukeles, the pointed hats perch on the upper shelves, suggesting they are too valuable to try on. The bejewelled ones are breathtaking and if you’re fortunate enough to have been married in one, you will proudly display it in your home. Typically, fabric saukeles either have a fur-like plumage or the more expensive ones feature owl feathers. The saukele fascinates me. I’ve read that tribes called “tigrahauda” (wearing pointed hats) once occupied vast territories of Middle Asia and Kazakhstan. In the 1970’s, Kazakh archeologists found an undisturbed burial place of a Saka chief from the 5th century BC. His clothes were covered with golden plates and he wore a tall ‘golden headdress.’ Similarly, something akin to the present day Kazakh saukele is depicted on two ancient golden belt buckles. Both men and women wore this tall, pointed headgear. Almost two and a half thousand years separate these treasures, yet the Kazakh saukele is still an important element of a wedding ceremony. I ask Nurbibi how long a bride normally takes to choose an ensemble. Rysgul translates to me that it can take as long as a year, but usually a month. “Yes indeed, how would you ever decide!” I say. “Will you please give my sincere thanks to Nurbibi for allowing me this opportunity, it’s been a pleasure.” When this is translated, Nurbibi returns the sentiment, a warm smile on her enchanting face. The subtle elegance of these ladies is in perfect harmony with the luxurious items that adorn the showroom…evocative in their modest, yet beguiling beauty. 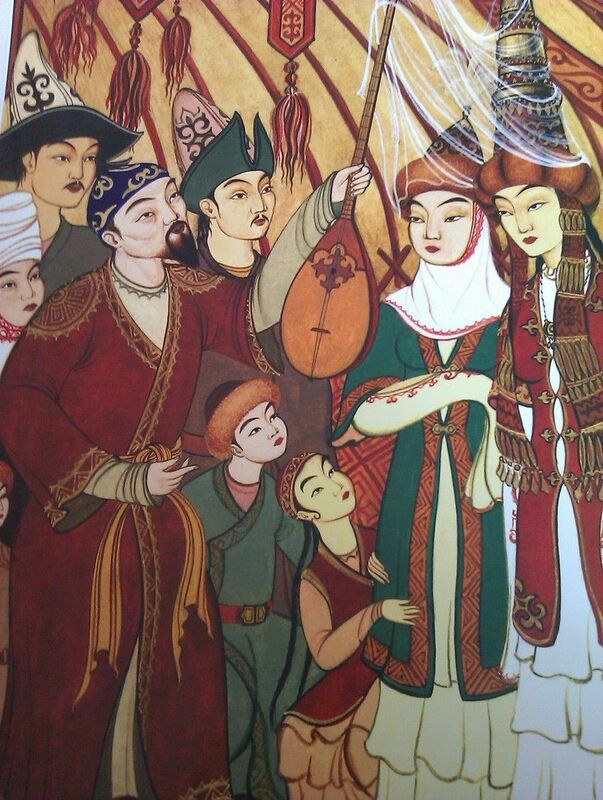 An old depiction of a Kazakh marriage. As we bid farewell and step back outside into dusk, Rysgul asks me if I had made a wish when we entered. “Yes I certainly did,” I assure her with a smile. And indeed I had. I wished this lovely new bride every happiness there is, with perhaps a newborn ‘prince of the hearth’ and a little ‘princess’ as well. * The kimishek is the traditional white scarf that a married woman wears in the home and elderly women in public. They are often embellished with decoration. Once banned when Kazakhstan was under Soviet rule, the Kazakhs have embraced them again since regaining independence in 1991.